ASSE International's Mission is to foster greater mutual understanding in the world by connecting families, individuals, and schools with high school foreign exchange students. 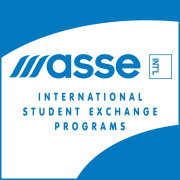 ASSE is a High School Exchange Program, with partnerships in over 40 countries around the world. When you become a host family for an exchange student, your entire family will discover a world of fun and enlightening adventure. Simply by sharing your home for as little as three months, a semester or a school year, you will be giving an exceptional young person from another country the opportunity of a lifetime-to live with your family and experience the language, customs and culture of our country. In return, your exchange student will bring to your family a bit of his or her homeland. Students come from Europe, Asia/Pacific, the Middle East, the Americas and Africa. Or you can choose to join our International Team of ASSE Area Representatives. As an ASSE Area Representative, some of the roles you will play are; counselor, advocate, and friend. Most importantly, you are making a difference in the world - one young person at a time! Would you recommend ASSE International?